Search results for "teacup chihuahua"
PLEASE CONTACT ME ASAP IF YOU HAVE ANY CHIHUAHUA PUPPYS OR A TEACUP AGES 6-8 WEEKS OLD. !! !Tiny Teacup Chihuahua Puppies For Sale!!! 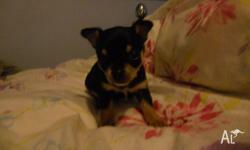 , ready to go is a purebred teacup chihuahua, mom is purebred dachshund. Beautiful colors..